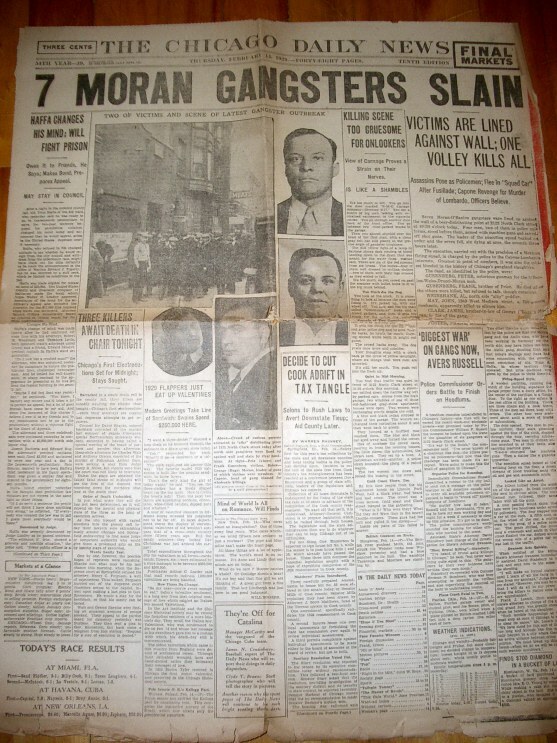 Jan.27,1925.Gang murders also story of George "Bugs" Moran identified by youngster as being one of Johnny Torrio's assailants. 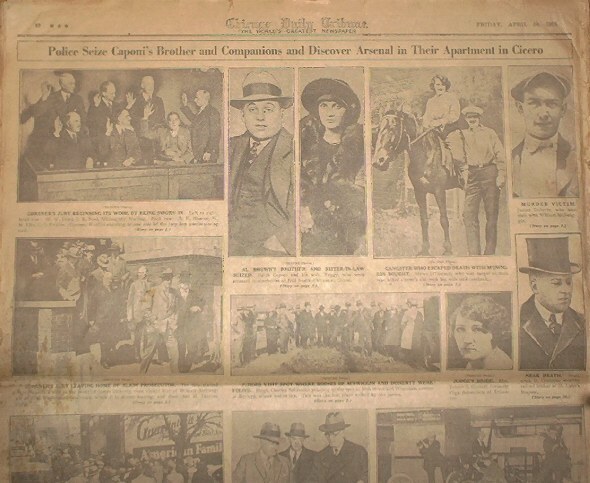 Chicago Tribune April 28,1926. 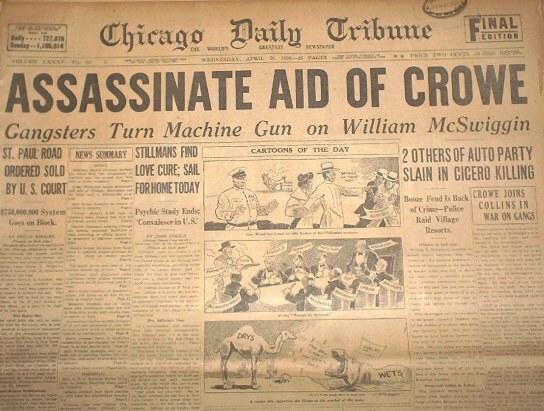 Prosecutor William McSwiggin is killed by machinegun fire. 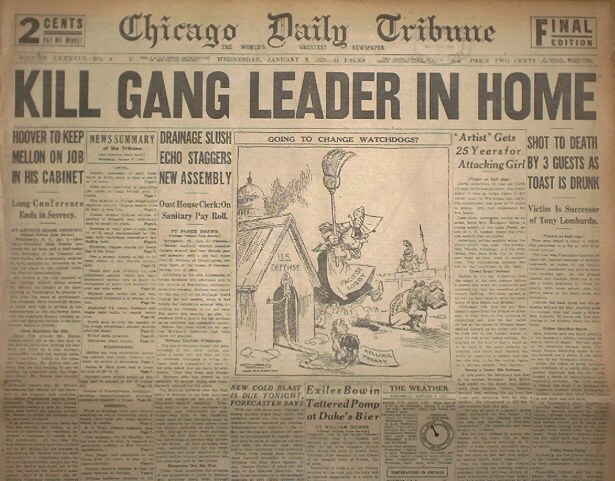 Chicago Tribune April 29,1926. 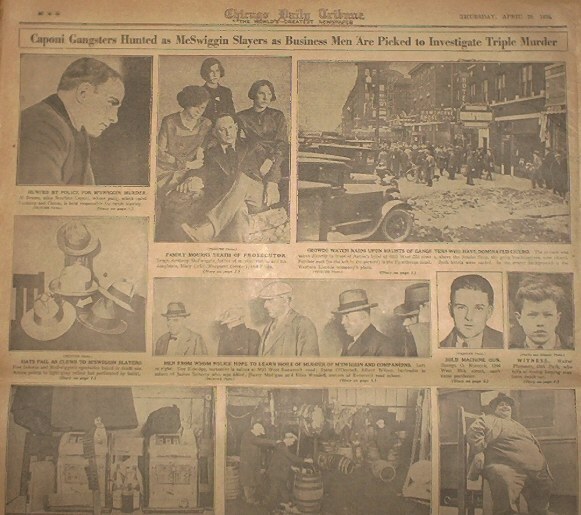 McSwiggin murder investigation. 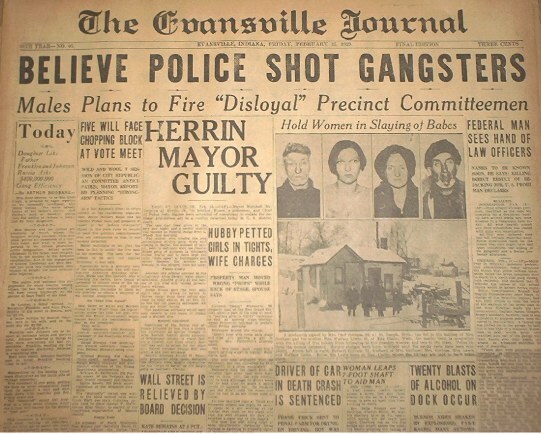 April 30,1926 McSwiggin story follows. 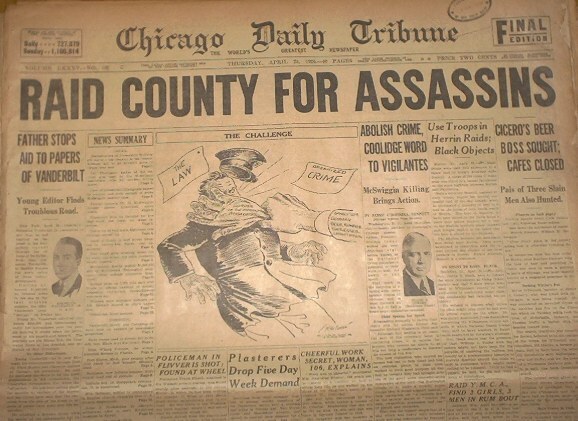 July 25,1926 Al Capone surrenders to the law. 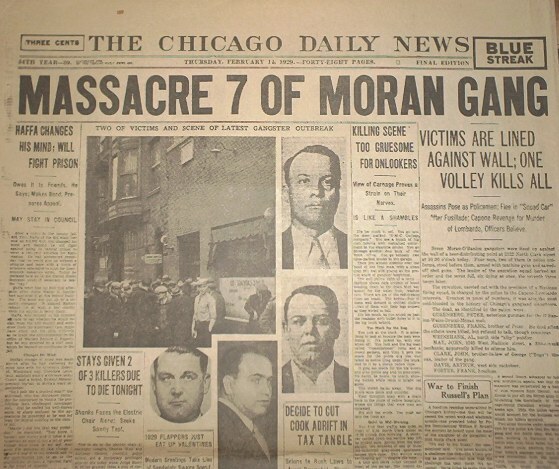 He's wanted for McSwiggin murder. 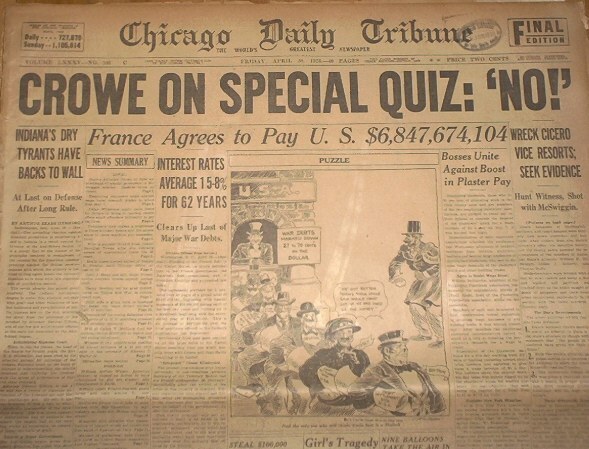 Sept. 21,1926. 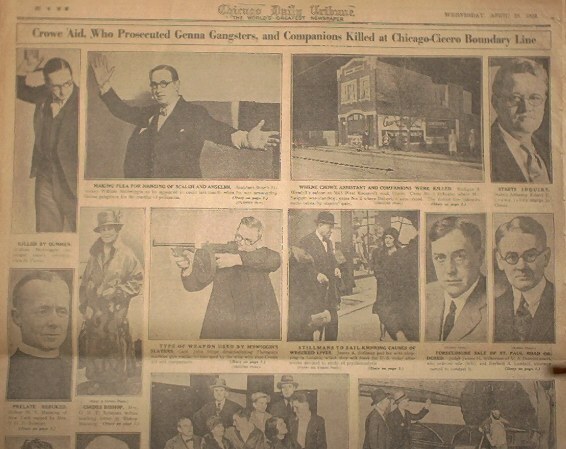 Carloads of Weiss gangsters riddle Capone's Hawthorne inn in Cicero. 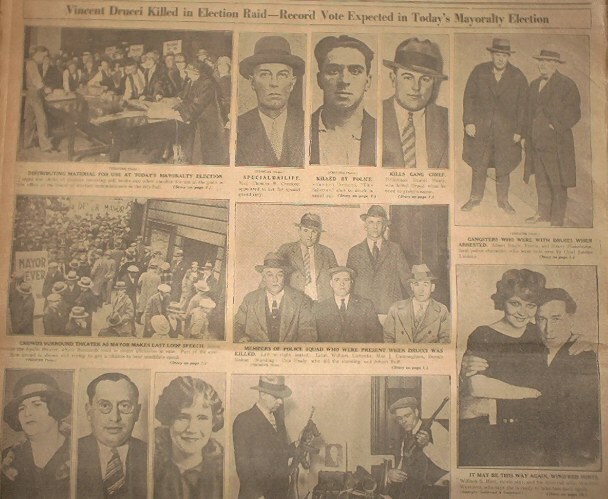 Chicago Tribune April 5,1927.Vincent "The Schemer" Drucci is killed by detective Daniel Healey. 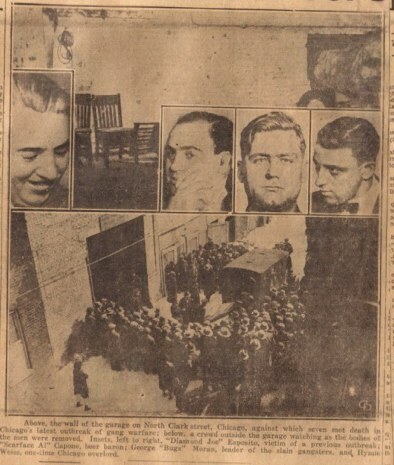 Chicago Tribune Jan.9,1929 Pasqualino LoLordo is shot to death in his home by Moran mobsters. 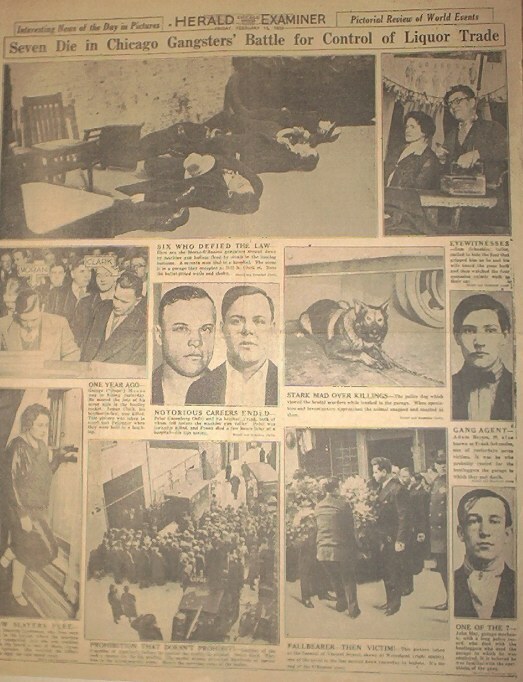 Montreal Daily Star Feb.14,1929 St.Valentine's Day Massacre mentioned. 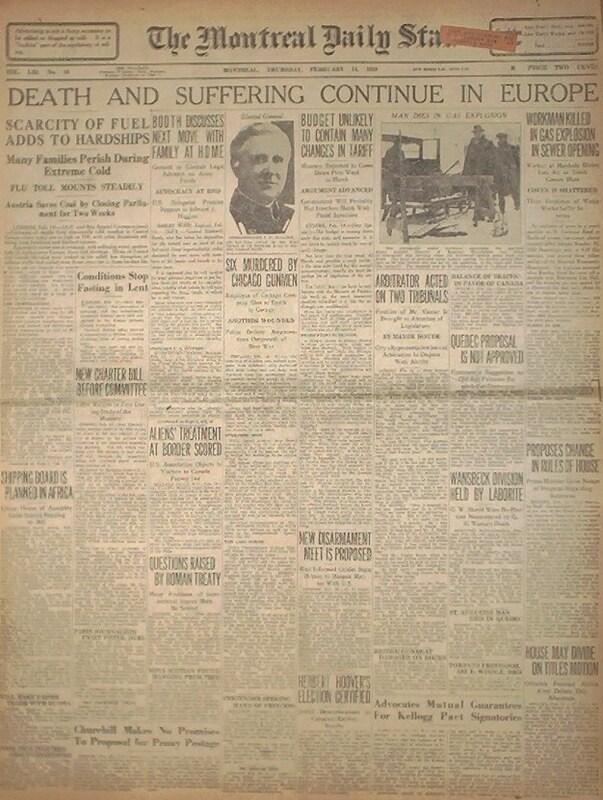 See story below from said newspaper. 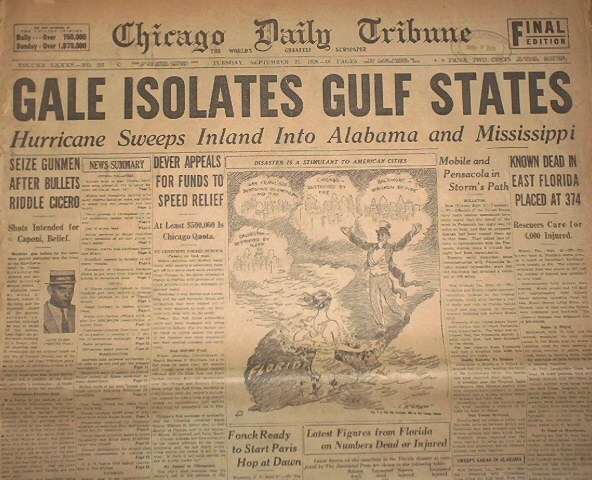 Shots that were heard the world over. 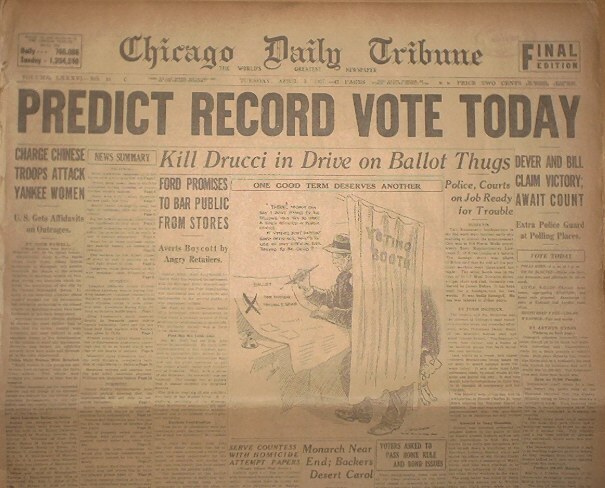 Chicago Daily news final edition for February 14,1929. 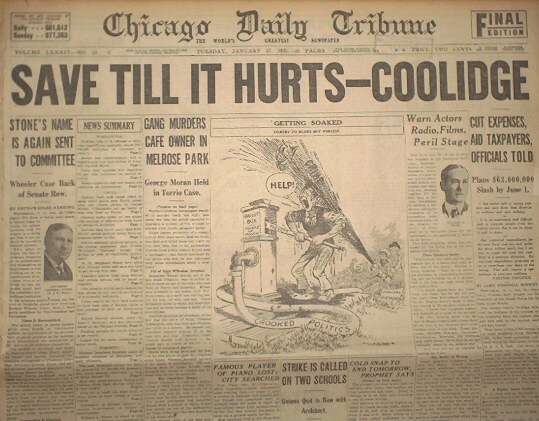 Chicago Herald Examiner February 15,1929. 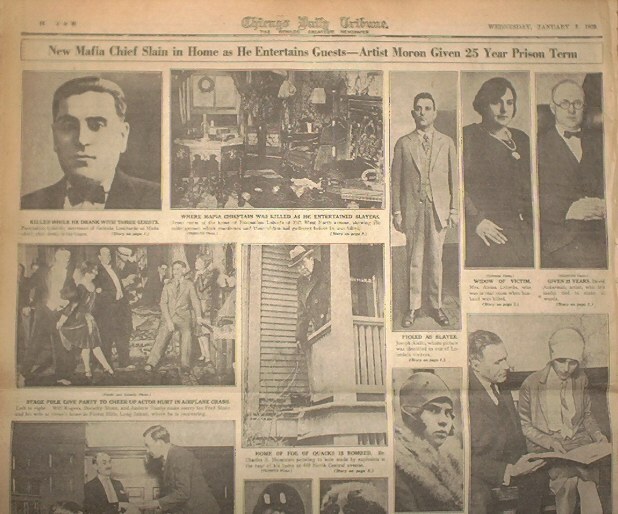 Photo page of Chicago Herald Examiner February 15,1929. 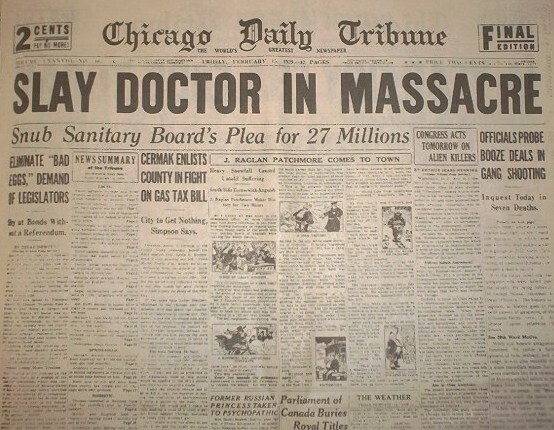 Several versions were printed during the day and evening . 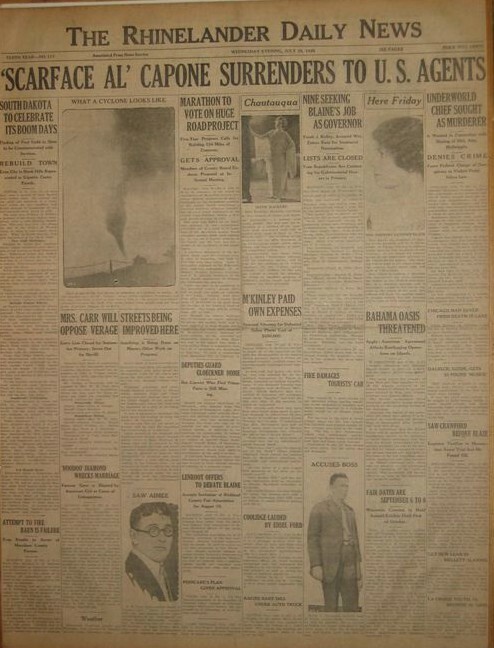 Chicago Daily News February 16,1929. 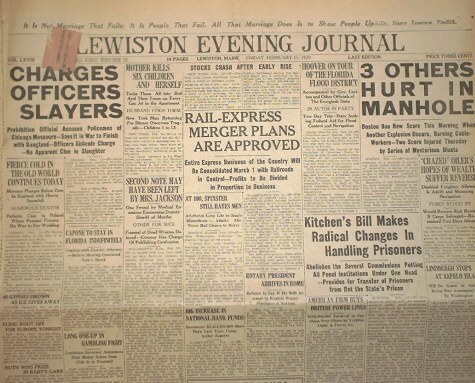 Lewiston Evening Journal February 15,1929. 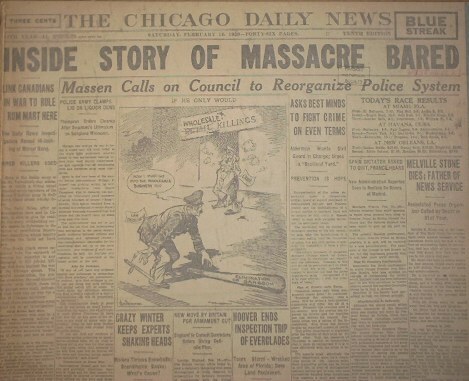 Paper reports police may have had hand in massacre. 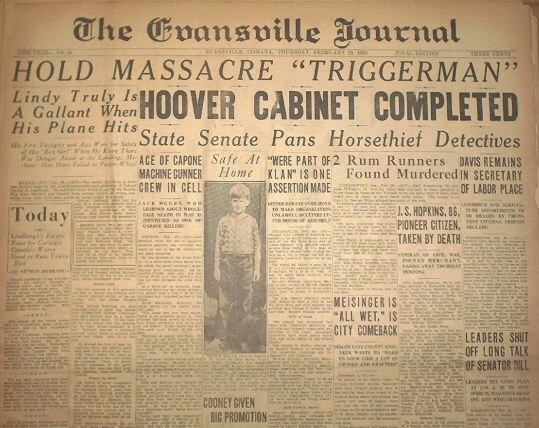 The Evansville Journal February 15,1929.It is also believed by this newspaper. 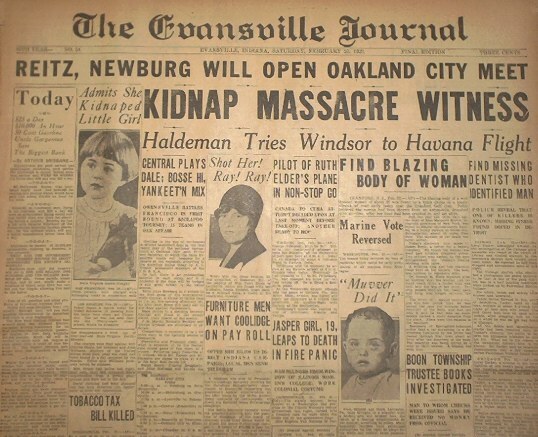 The Evansville Journal February 20,1929 Dentist who may have treated one of the slayers at massacre is kidnapped and later released. 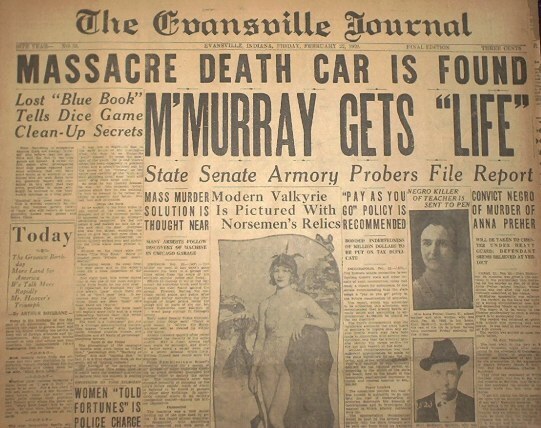 The Evansville Journal February 22,1929 one of the fake police cars used at massacre is found in a fire. 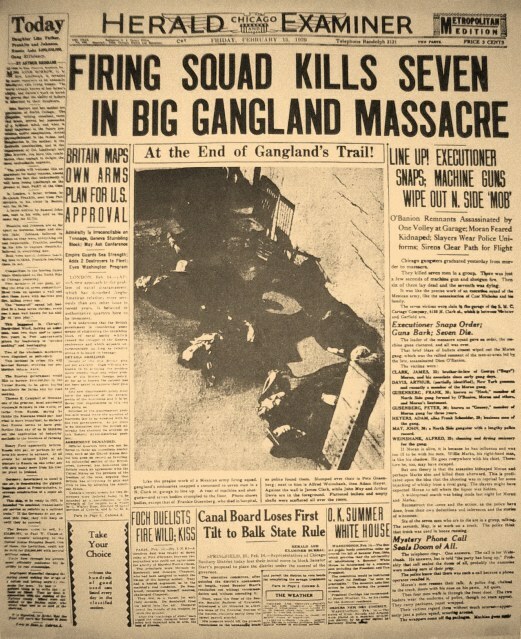 It was being dismantled by torch when it exploded.The gangster dimantling it escaped and was not found. 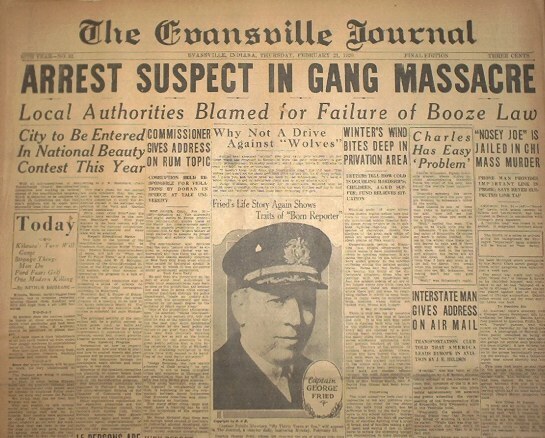 The Evansville Journal February 24,1929 a suspect by the name of Nosey Joe is arrested and later released. 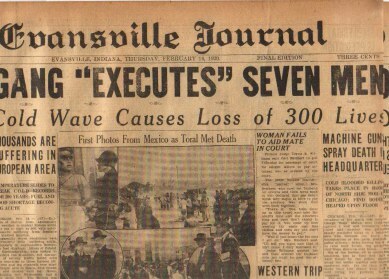 The Evansville Journal February 28,1929 Jack McGurn is arrested in connection with massacre.